Dog owner Ola Helsing so wants another free dog park in Columbia that she’d drive several miles to get there. She and other dog owners could soon get their wish with a free dog park planned for Owens Field Park. But not everyone supports the idea. Ola Helsing has complained for years about not having a place in Columbia to take her three dogs. She lives in a Gervais Street apartment, and some parks are too far away. Others require a membership or annual fee. Only the city’s Emily Douglas Dog Park on Wheat Street is both free and public, but Helsing said it’s not well-maintained. Ola Helsing says Owens Field Park would be the perfect place for a dog park, even though it’s 4 miles away. She lives with her three dogs in an apartment on Gervais Street. She and other dog owners could soon have another option, however – a free dog park planned as part of the renovations to Owens Field Park. And Helsing, who used to live in Rosewood, says she’d happily drive the almost 4 miles to her old neighborhood several times a week to let her dogs play. “Columbia should be more dog friendly, and being dog friendly means having more dog parks,” Helsing said. Dog parks where owners can let their animals run free have grown 20 percent in the past five years, according to The Trust for Public Land, which says they grew faster than any other kind of urban park. “Dog parks are great because dog owners go to the parks early in the morning and after kids leave at night, so parks with dog parks see more consistent use,” said Abby Martin, a researcher at the trust. There has been little opposition to opening dog parks in Columbia because they offer contained areas for dogs to socialize and exercise, said James Hill, associate director at Richland County Animal Care. But they are not without issues. Most dog parks start as free municipal parks but eventually require membership fees to help pay for maintenance, said Roseanne Conrad, president of the National Dog Park Association. A container for mitts so people can pick up after their dogs stands empty near the front of Owens Field Park. Rosewood residents have complained that dog owners don’t pick up after their dogs, and some fear the dog park could increase the problem. She said it took her four years to get a dog park in Martinsburg, Pennsylvania, because some town leaders and people without dogs assumed there could be excessive waste, noise and dog fights. Blair County Dog Park requires a membership and fees. And some parents don’t want dog parks around, at least near playgrounds, even if the dog parks are fenced because their children are easily frightened, Martin said. The planned $50,000 dog park at Owens Field Park also has its detractors. Owens Field’s 50 acres already are crowded, and the space could be better used, said Jenna Stephens, past president of the Rosewood Community Council that represents the neighborhoods bordering the park. She said dogs have dug holes and owners have left behind waste in Lester Bates Park, a Rosewood community park on Wando Street, and that some residents fear the same will happen to Owens Field. But Michele Huggins supports the new dog park because, she said, too many dogs run freely in the playground and baseball field at Valencia Park on South Kilbourne Road where she oversees children’s baseball. Moses, Sarah Williams’ dog, plays fetch in Emily Douglas Dog Park. Williams brings Moses there because it’s free, unlike other dog parks in Columbia. “I don’t need one of my kids – we have a lot of kids that play ball here – I don’t need them face-planting in what-in-the-world your dog’s business is,” said Huggins, president of the South Kilbourne Neighborhood Association. Another dog owner, Sarah Williams of Columbia, brings her dog, Moses, to Emily Douglas because it’s the city’s only free dog park. But Williams, like Helsing, said she would take Moses to the new dog park. Helsing said each of the Midlands dog parks she’s visited has issues. For instance, Lake Carolina Dog Park is only open to Lake Carolina residents, while Sesquicentennial State Park’s dog park and the NOMA Bark Park in Elmwood each requires an annual $25 pass. Columbia Dog Park on Humane Lane is both members only and $35 a year. The state law prohibiting dogs from running around off property without restraint. The city law requiring all dogs be confined or restrained within city limits. Michigan State University provides a table of dog leash laws for all states. The Trust for Public Land created a guide on dealing with conflicts when creating dog parks (PDF). 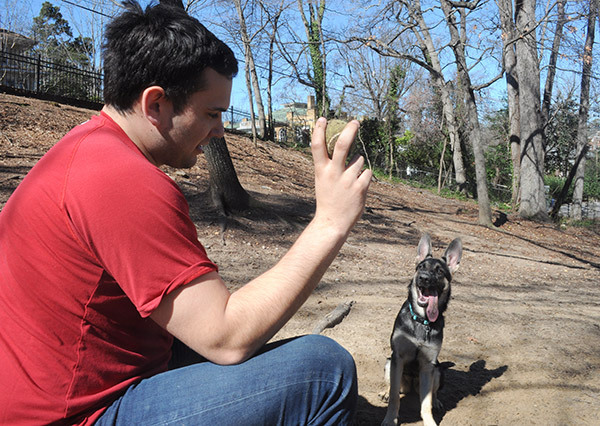 Watch to see Adam Duff and his dog, Scout, play with other dogs in Emily Douglas Dog Park. The idea for the Owens Field dog park came up about three years ago when the Rosewood community was discussing the larger renovation plans, said Mark Miller, president of the Rosewood Community Council. Those renovations, which would cost about $2.7 million in two phases, were supposed to start last fall but have been delayed due to stormwater runoff and drainage issues, Miller said. Construction now could begin in May, said Todd Martin, Columbia’s park planner and manager. The dog park, part of the first phase, will go to the right of the Jim Hamilton Boulevard entrance. Next Post Through wrestling, Hyatt Park program grapples with enriching boys’ lives, involving more fathers.